Up in the sky, look: It’s a bird. It’s a plane. It’s Superhero preschool activities! You can create these learning activities faster than a speeding bullet while leaping over tall buildings in a single bound! 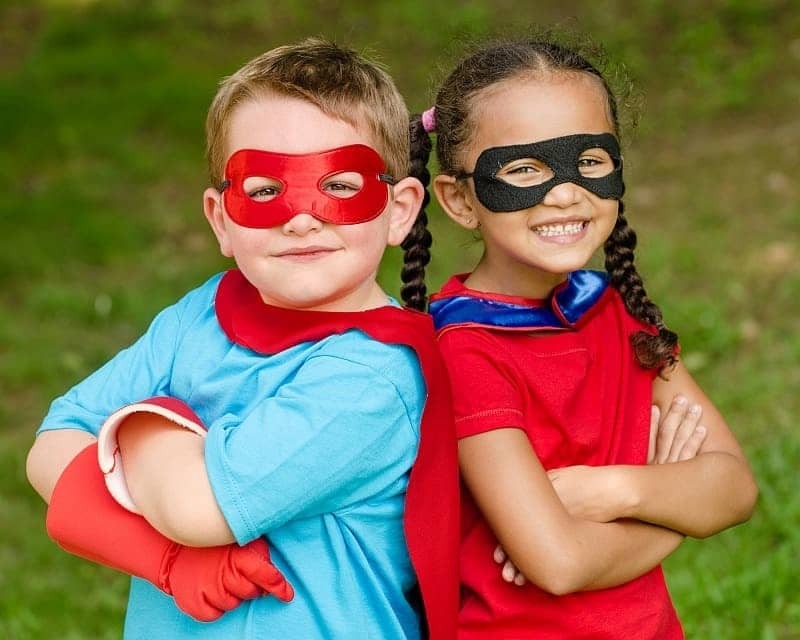 Your little superheroes will have a ball! A simple and safer superhero cape can be made from an old t-shirt. Cut off the front and sleeves leaving only the neck hole and the back of the shirt. This will allow the child to put the cape on over their head rather than tying it. Decorate the capes with fabric paint or tie dye them. In our class each child chose a super hero name which we put into a rhyming slogan (ex: Faster than a bat, it’s under Cat!) We cartooned pictures of each super hero (you can find various sites on the internet to do this). We printed them out to make a comic book cover. We found foam glasses that the children decorated for masks with foam stickers. You could make them card board but the glasses seemed to hold up better. Using name brand “Tacky Glue”, put the glue all over wax paper (you may want to help younger children because the glue is thick and hard to squeeze out). Let them dry completely; I always let mine sit for at least 24 hours. Carefully peel the “spider webs” off of the wax paper. You will have free standing spider webs that you can hang from the ceiling or on a window. Save enough toilet paper cardboard rolls so each child can have two. Cut a slit up the middle of each roll. Let the children decorate the rolls with crayons, stickers, and fun foam. Once they are dry, let the children put their superhero cuffs on and save the day! Take some dolls or stuffed toys and leave them stranded on the playground, the school, the neighborhood and let the children go on a mission to find and save them. When we did Superhero week We put toys up the flag pole, on light poles, signs, in trees and bushes around our neighborhood. If I remember correctly we decided to go on a walk to see if there was anyone in need of our help. (my aide had put the toys around before coming to work). We took a stroller with us. As we found each toy we put it in the stroller to take back to preschool with us. Fill each medium sized margarine tub with water. Put a superhero figurine in each tub. Gather the rock salt, sand, and sugar. Remove the ice with the frozen superhero from each of the margarine containers. Put each frozen block of ice with the superhero into a large tub. Ask the children in your class if the salt, sugar, or sand will save the superhero the fastest. Pour the salt over one of the blocks of ice. Pour the sugar over one block of ice. Pour the sand over one block of ice. Observe and record which of the three substances melted the ice the quickest. At the end of the year, we put together a slide show with pictures from their superhero adventures and the song “Superman” as background music.